.II. Facts about the ARC . "Somewhere in England" . 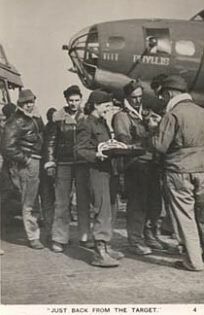 The Clubmobile Service which was a big boost for the morale of soldiers overseas was created as part of the Club Service. 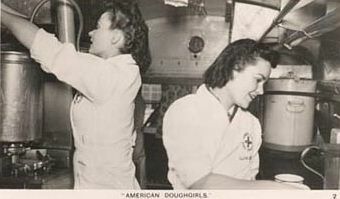 A service club on wheels brought coffee, doughnuts as well as -for example - magazines, books, cigarettes, life-savers, gum and even musical entertainment through phonographs to the fighting men. The first ARC clubmobile service initiated by Havey D. Gibson, ARC commissioner for Europe, started their work in England in 1942.
. 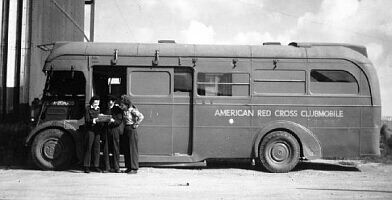 It is important to remember that ARC clubmobiles operated throughout the frontlines of America's war effort. They not only served in England and other parts of Europe, ARC Clubmobiles were also stationed far within India and Burma along the dangerous and largely forgotten China-India-Burma front of Asia. There clubmobiles advanced with the Burma Road, a vital battle route being built to link China with India. It was often bombarded and always under combat conditions. The clubmobile vehicles carried almost everything to soldiers serving in this remote region.
. Along with the popular coffee and doughnuts, the clubmobiles delivered mail, shaving cream and razors, and even pingpong balls. These clubmobiles were operated by 2 women (not 3 as in Europe), who also hosted morale-boosting parties at the rugged jungle sites. 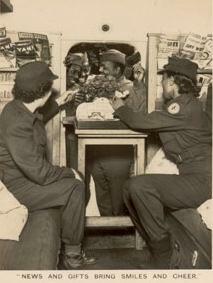 Each clubmobile woman and her partner staffed their clubmobile on a 24-hour basis under the most dangerous conditions. Some were stationed at the forward airfields used by planes flying "over the Hump" into China itself. 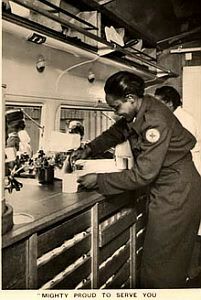 The American Red Cross Clubmobile Service had also Black women serving as Clubmobile Workers during WWII. Because of the segregation policy of the United States, they were only allowed to serve black soldiers. .
(where divisions assembled before shipping across the channel to France).
. [ I. Development ]..[ II. Facts about the ARC ]..[ III. Uniforms ]..[ IV. Sources ] .